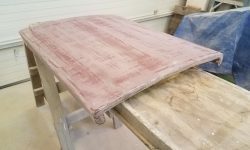 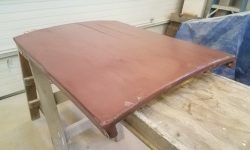 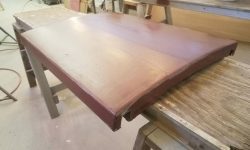 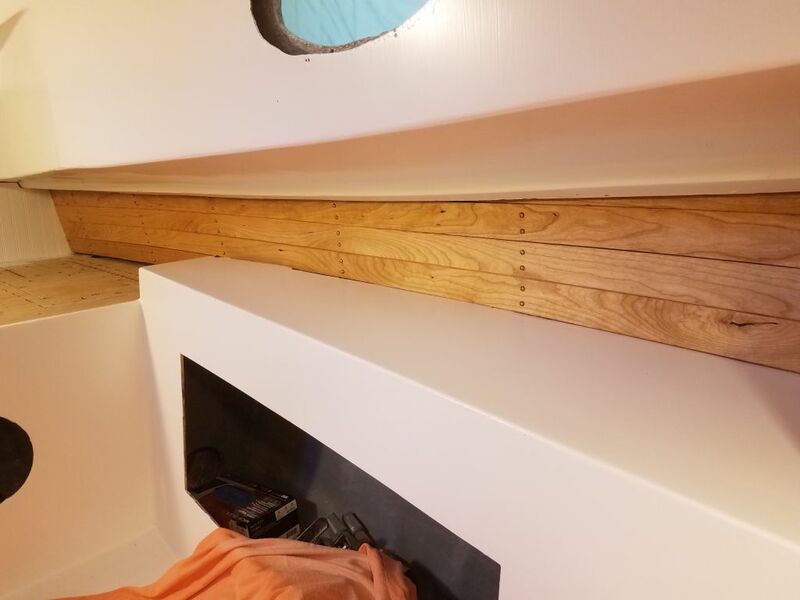 Before getting back to work in the trim inside the boat, I took a few minutes to lightly sand, as necessary, the first coat of fairing compound on the companionway hatch. 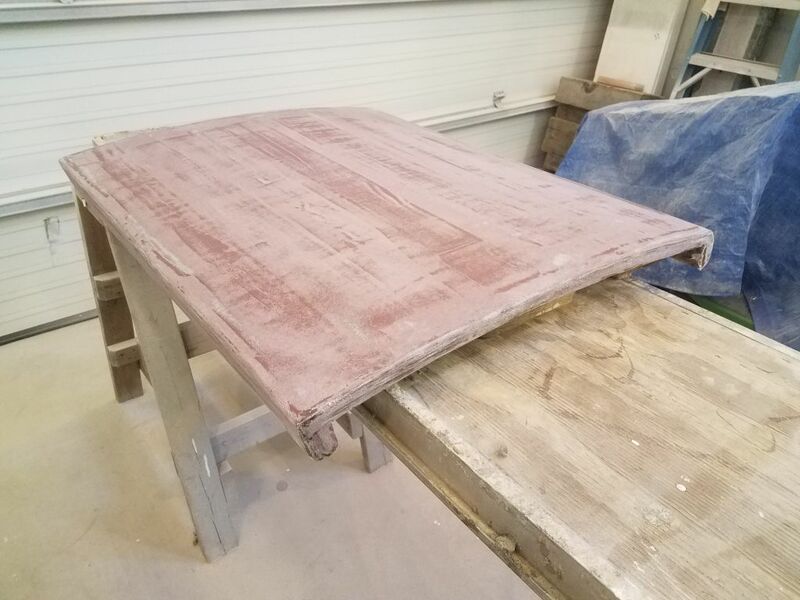 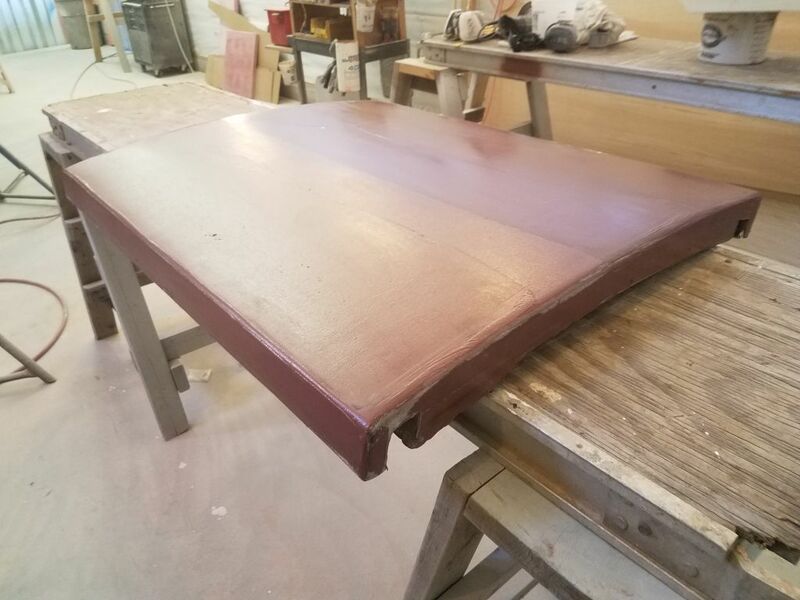 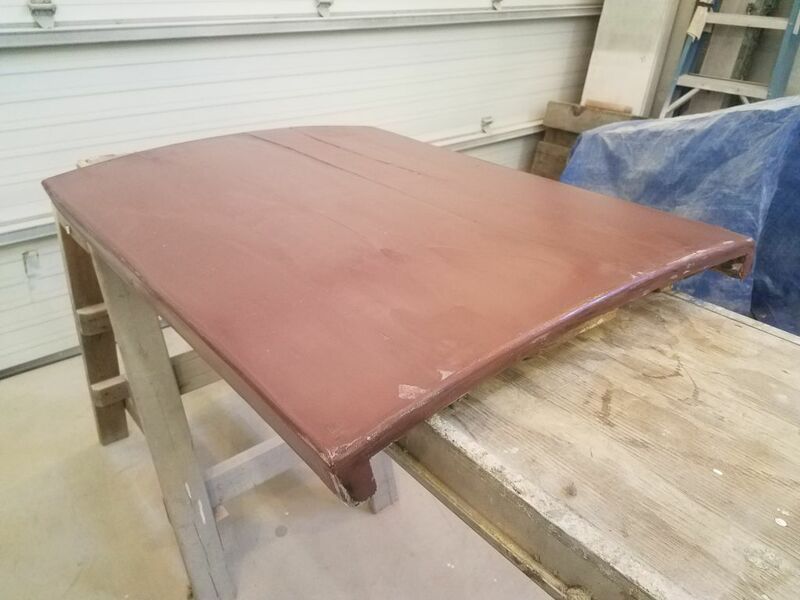 Afterwards, I applied a second coat of epoxy fairing compound with a broad trowel to conform to the overall shape of the hatch’s curvature and smooth in the low areas formed by the original surface. 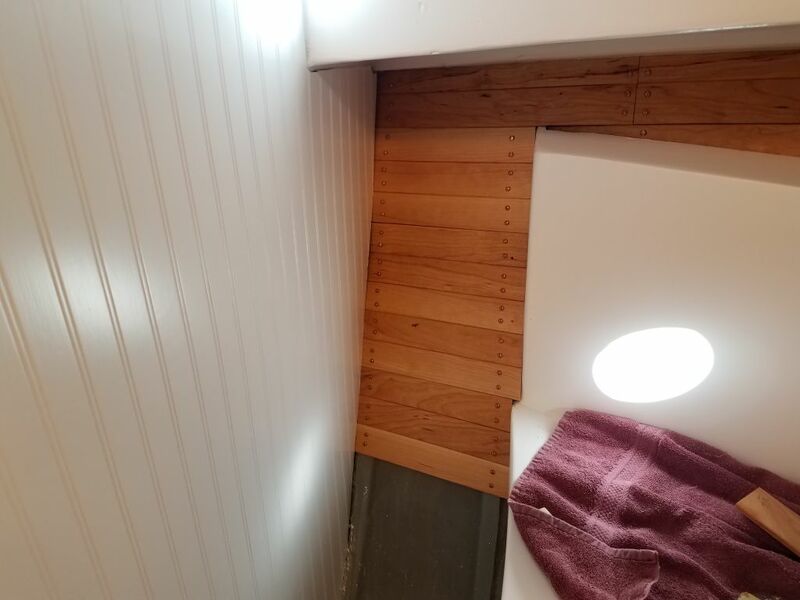 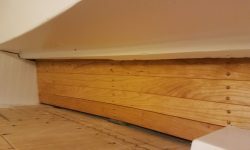 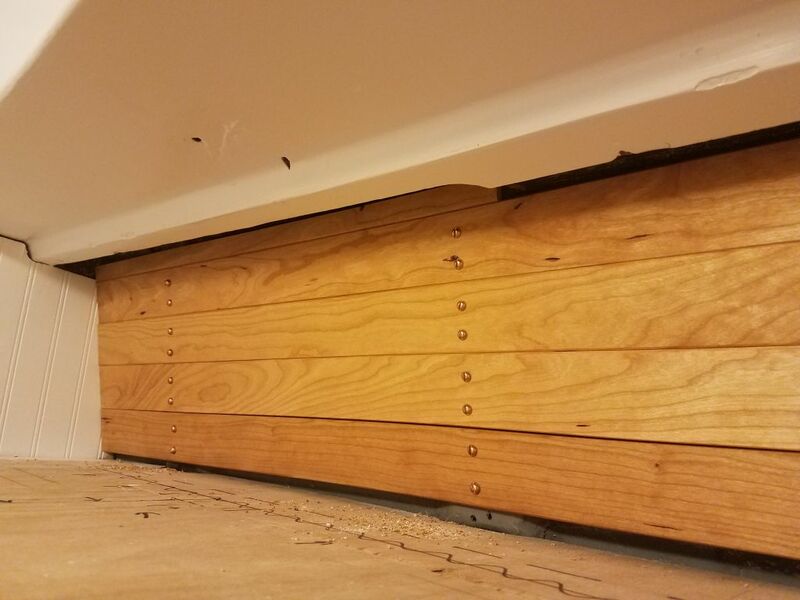 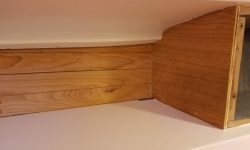 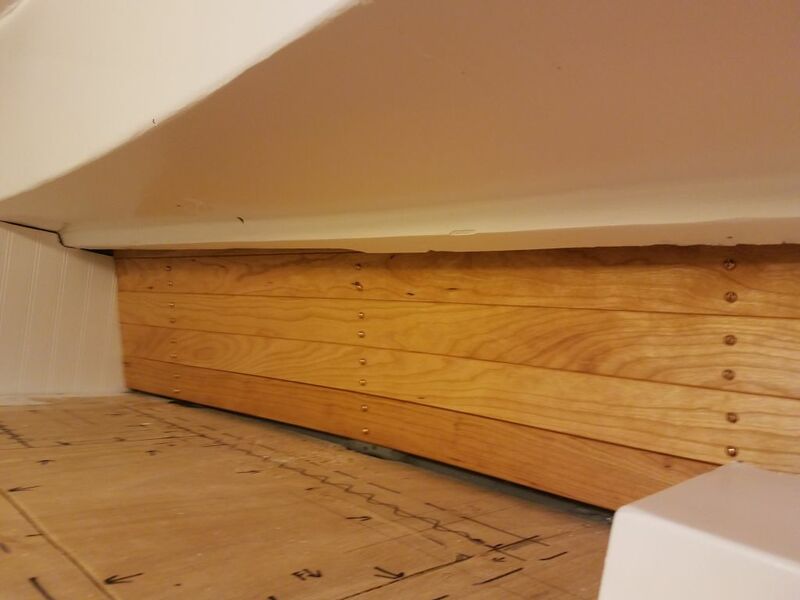 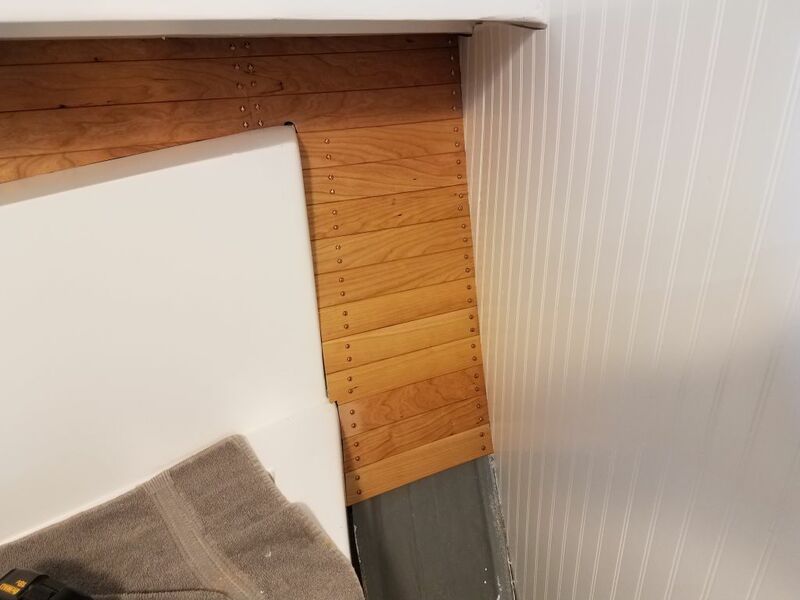 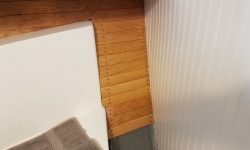 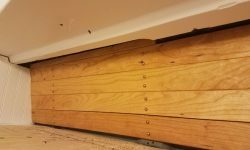 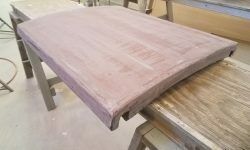 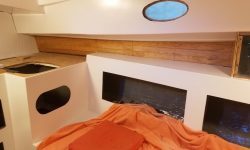 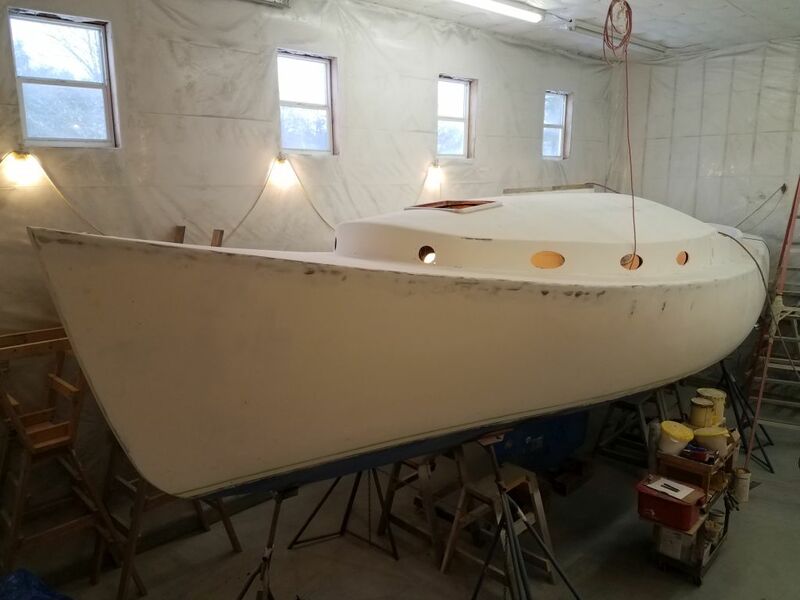 Back in the boat, I finished up the port side of the main cabin ceiling, beginning with the final full-length board with its short extra width attached at the aft end. 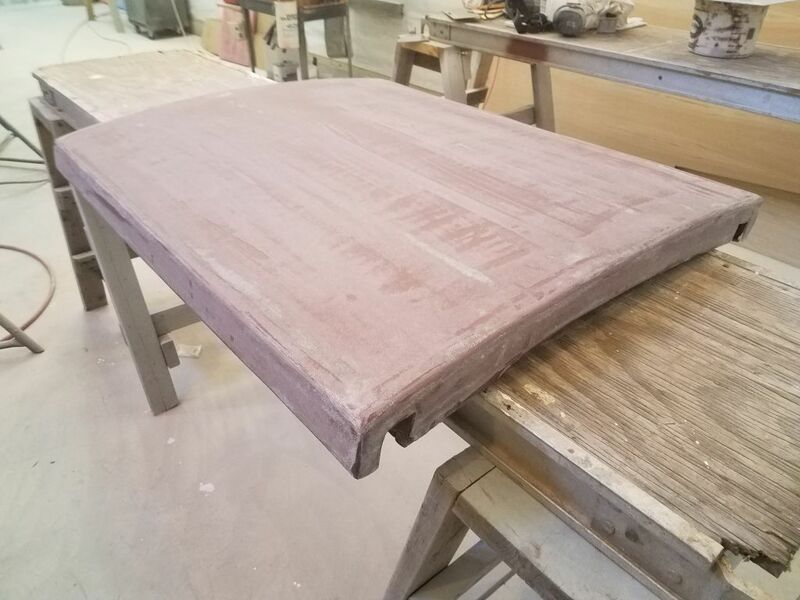 This left only a short piece at the forward end to complete the work here. 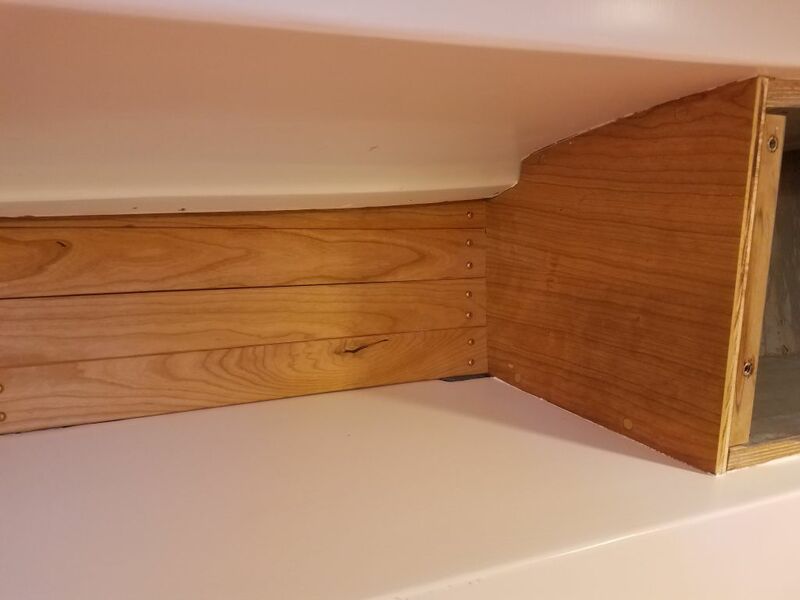 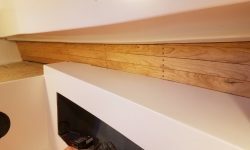 I made a template of the curve at the outboard corner of the settee shelf where it met the ceiling, since I needed to prepare some trim to cover some of the uneven fiberglass edge on the shelf, but at the moment I didn’t have stock ready for the trim, so I set aside the template till another time. 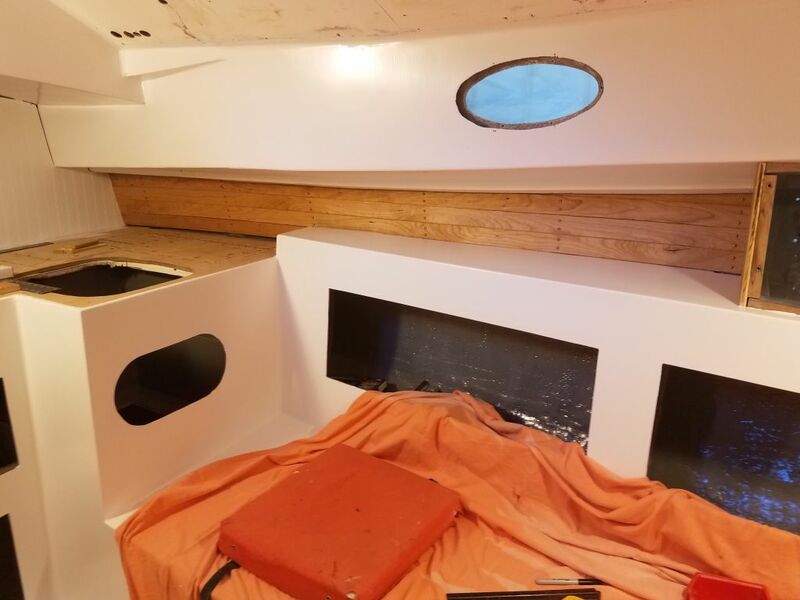 Now, with all the long pieces of ceiling in place, I could get back to work in the forward cabin, where I spent most of the rest of the day cutting and fitting as many of the short pieces of ceiling at the aft ends of the space as I could, using two remaining longer boards on hand and any offcuts from earlier that were long enough. 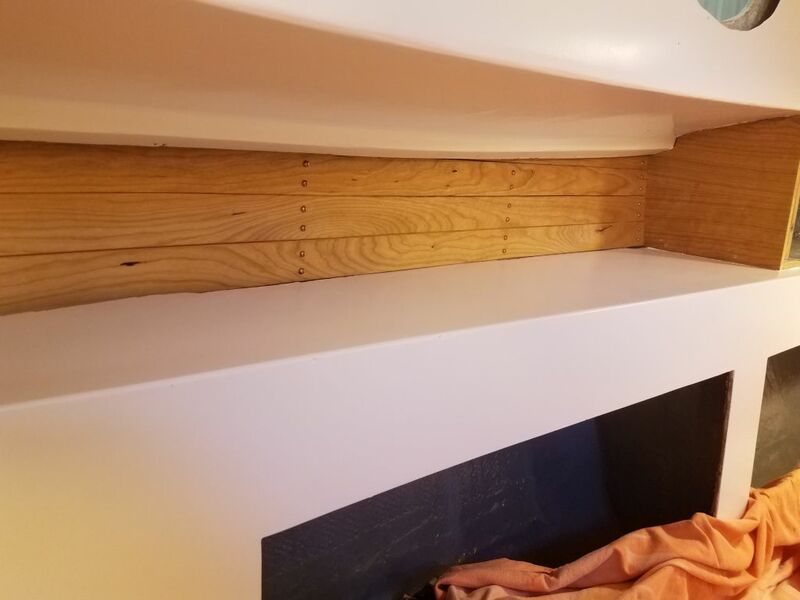 Short as the pieces were, it took just as long and required nearly the same work to install these little strips as it would have if they’d been longer, since most had to be individually measured and cut; I did have some success cutting two at a time, using the first as the marker for the second, but generally the spaces required more individual attention for each piece. 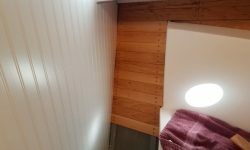 I worked on both sides to bring the new ceiling down below the level of the berth top, since this would allow me to continue other trimwork in the space, but I ran out of suitable ceiling stock before I could finish, so the rest would have to wait till I could mill some additional 1/4″ x 2″ stock for this purpose, as well as other uses like the cabin sole and other trimwork.